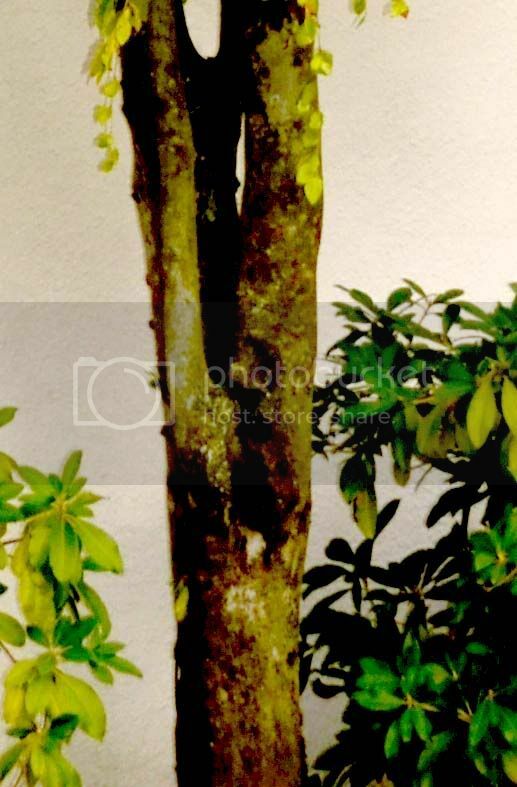 Does anyone know what kind of tree this is? I took a photo to the nursery today and it had them stumped. I thought I'd try asking here before I go take more pictures so they could try to narrow it down. Busy now, will look around for it later today. First thought is weeping something as the common name. Can't be sure without a better pic, but that looks awful like a weeping willow. Can you get a close-up of the bark? Argh yes I've just seen it weeping... beech? YES, that's what I'm thinking of even if I'm wrong. It's not a willow or a beech. The shape it is in the photo is the shape it grows -- it doesn't spread out. I asked the owners of one house that has one if they knew and they didn't know either. The nursery guys asked me to go back for close up photos of the bark and leaves saying maybe they could narrow it down a bit more so I'll probably have photos soon. If you can get close up shots - get at least one that shows the pattern in which the leaves come out from the nearest twig or branch. It will help to key it out. I was thinking one of the weeping cherries though that isn't typical form for them that I know of - mmm, a weeping plum variety? looked up some cherry leaves to get an idea, though the ones in this link have a bit of a problem, so just re the general look of the leaf see if it fits. 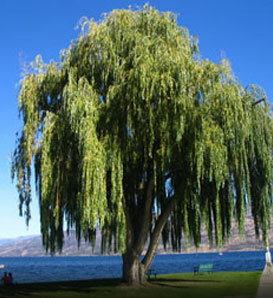 Not a willow, to me. Those weeping cherries are gorgeous! I walk past a couple of these often enough to know that they don't flower so I'm thinking it isn't any variety of fruit tree. Good, I was going to ask that. This is sparking a memory..
puts off going to the store. Hmmm. Fagus sylvatica pendula? 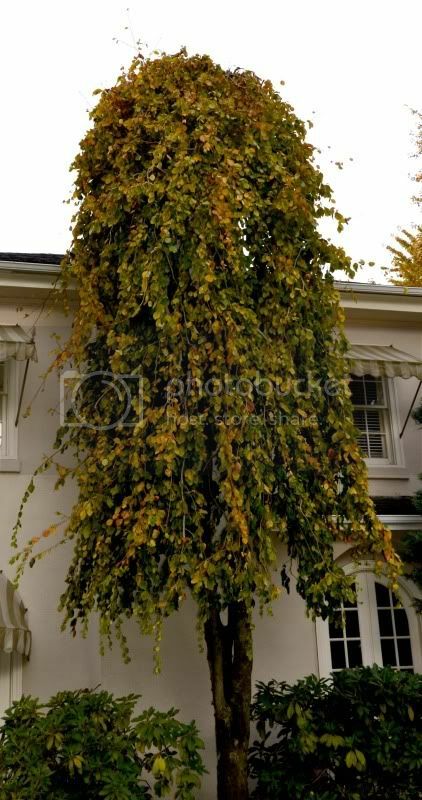 weeping beech..
That's what Soz suggested but the guys at the nursery actually ruled that one out because of the bark. Maybe my photo didn't give them enough information or the print was deceptive. The ones I've seen are more like the one in the photo though, narrow all the way up. oops, I didn't read back when home from the store..
well, anyway, I didn't see beech mentioned, but that brings up birch - thinking of Betula nigra pendula - but the photos I've seen have the bark more white, though I'm sure I've seen the tree in person, I don't remember strongly re the bark. Not many birches in west LA. for good reason. Looks again, still betting beech. Is it native to your area and what area are you in? Morus Alba Pendula, weeping mulberry, maybe? That looks rounder than the weeping beeches I've seen (i.e. more like boomer's photo). The mulberry leaves I saw earlier didn't look right to me, but then I can't see the leaves on boomer's that well..